Keysight InfiniiVision 3000 X-, 4000 X-, 5000, 6000, 7000 (except 6000 100 MHz) and Infiniium 9000 and 90000 Series. The N2795A is a new generation of low-cost, single-ended active probe with the AutoProbe interface. 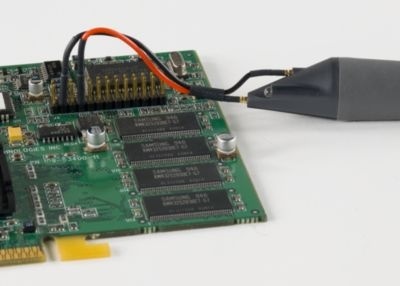 The probe integrates many of the characteristics needed for today’s general-purpose, high-speed probing - especially in digital system design, component design/characterization, and educational research applications. Its 1M? input resistance and extremely low input capacitance (1 pF) provide ultra low loading of the DUT. This, accompanied with superior signal fidelity, makes this probe useful for most of today’s digital logic voltages. And with its wide dynamic range (±8 V) and offset range (±8 V), the probe can be used in a wide variety of applications. For high signal integrity probing, the N2795A 1 GHz active probe is a perfect complement to Keysight’s 500MHz – 600MHz bandwidth Infiniium and InfiniiVision Series scopes. The N2795A is equipped with a white LED headlight to illuminate the circuit under test. The probe is powered directly by the InfiniiVision and Infiniium Autoprobe interface, eliminating the need for an additional power supply. 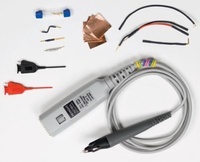 The probe also comes with a number of accessories that allow for easy connections to the circuit under test.